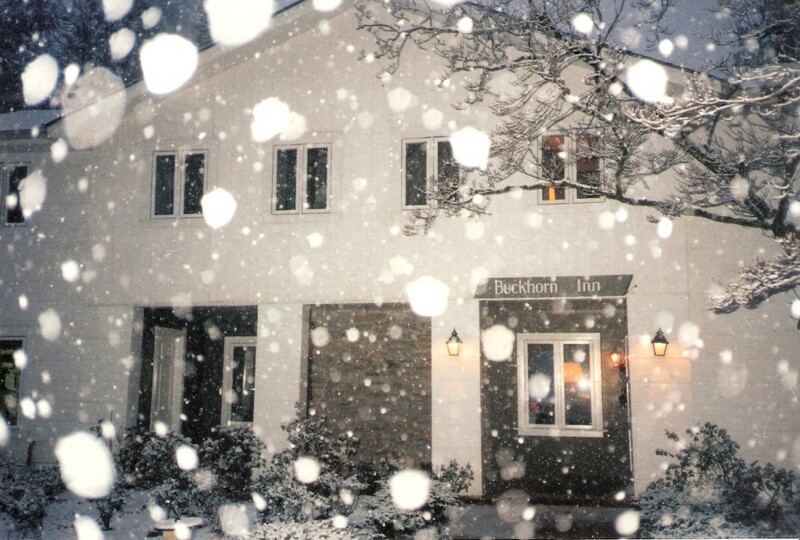 In some 27 years of visiting the Buckhorn, our most treasured memory is of enduring the natural disaster that was the Blizzard of 1993, a.k.a. “The Storm of the Century.” The storm was a bona fide natural disaster, starting in Florida with deadly rain, wind and flooding, and morphed into a mid-March snowstorm that buried the southeast and eastern seaboard. It is recognized by NOAA as one of the five worst storms of the twentieth century. 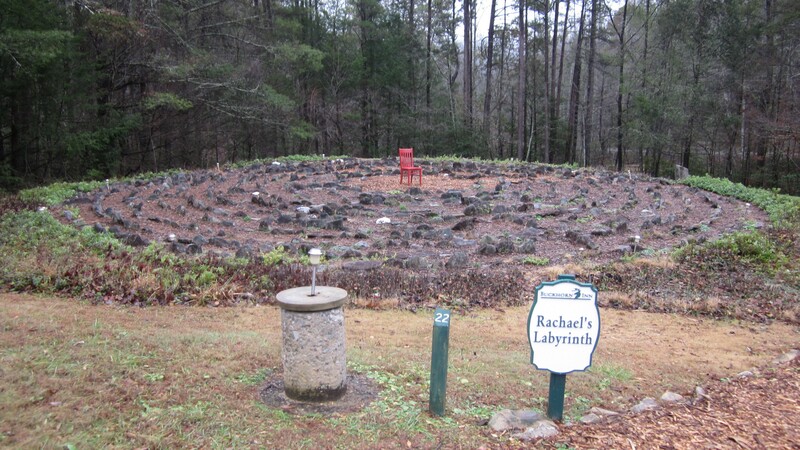 We arrived at the Buckhorn on Thursday evening for a long weekend “spring break” of hiking and relaxing, and within 24 hours knew that we were in for much more of an adventure than we ever dreamed. Also with us as guests of the Inn that weekend were the four delightful couples from Oak Ridge that were here for a weekend of bridge – Gordon and Jean Jones, Norman and Louise Hildreth, Ervin and Sarah Kiser, and Clyde and Ada Hopkins. 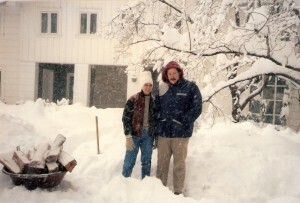 Martin Rosenberg and Liz Morgan, college professors from Kentucky were staying in one of the cabins, as were Riaz and Behroz Padamsee, business owners from Raleigh, N.C. The Inn was substantially full for its capacity at that time. The blizzard of ’93 began during Friday night. Gatlinburg, we headed back to Buckhorn, making a strategic stop at Park Liquor, just in case. On Friday night we watched a steady snowfall start to accumulate on the front porch hedgerow, and even as we went up to the Tower Room at bedtime that 12 – 18 inches seemed pretty accurate. But then during the night we woke up to hear noise in the parking lot, and looked out to see Rick Willard, one of the inn employees, and John Burns, innkeeper at the time trying to grade snow off of the parking lot with a tractor. Then we realized the electricity was off, and it was game on. 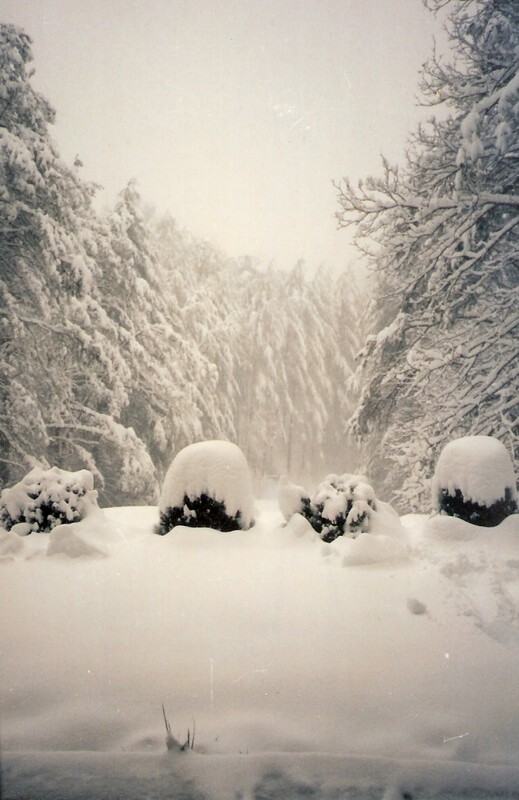 On Saturday morning we came downstairs to join everyone huddled in front of the fireplace listening to a battery operated radio, and watching it continue to snow. The inn had a generator large enough to run electricity for parts of the inn, but not all at the same time, so there was strategic switching between running heat, lights, coffee makers, and the water pump in the main inn. Jo Ann Preske was the only staff member that could get to the inn, walking from her house up on Buckhorn Road. Jo Ann and Connie Burns had to handle the cooking and strategically planning the use of food on hand to feed guests three meals a day instead of just two. Then there was the concern of keeping gas for the generator. We all actually volunteered to let the staff try to siphon gas out of the cars, but discovered that cars had baffles installed on the gas tanks to prevent gas theft! Luckily, John and Rick managed to get to a gas station at some point to replenish the supply. So looking back on it from today’s vantage point the whole situation had lots of potentially scary pitfalls, not the least of which was the fact that the temperatures were frigid – near zero. Yet everyone kept their composure and just adapted to the situation as best possible. We washed dishes, helped take firewood to the cabins, read books, talked, the bridge players played bridge, and we chilled wine in the snow. The fireplace area looked like a refugee camp with coats and gloves and boots strewn about to dry at least a bit. Snow filled the entire veranda space and the hill beyond which became an ideal sledding venue. to tackle the job of cleaning snow off of the cars. 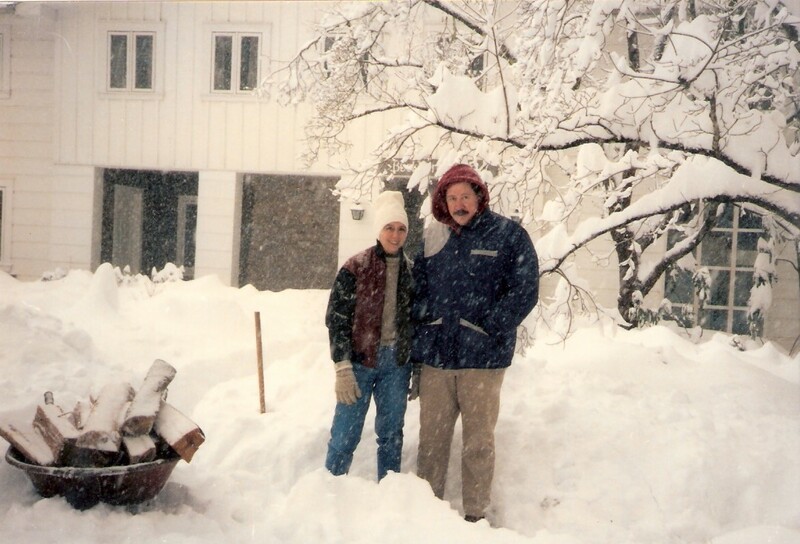 That is when we got the official snowfall measurement of 34 inches. At the time Eddie and I had a Pontiac Transport minivan that was almost entirely covered. One of the most interesting differences between then and now is that none of us had cell phones in 1993. Fortunately, one of the folks from Oak Ridge had a car phone, which was the predecessor of the cell phone, and he was very kind to let those of us who needed to call family, work, dog sitters, and others to let them know we were safe and coming home as soon as possible. The main issue we had with getting home was the road condition for access roads from the Buckhorn to the main highways. There was not only ice but also downed trees and limbs. By Monday, many were able to begin leaving, but we waited until Tuesday morning because of the 7 or 8 hour drive back to Memphis and still allowing for some icy spots on I-40. On Monday afternoon many from the neighborhood came and sledded down the hill in front of the Inn, then on Monday evening a whole group from the neighborhood, including the G. Webb family and the Preske’s all pitched in to cook a great meal of what probably was some of the last food left. On Tuesday morning we threw dirty clothes in the minivan and took off for home! Of all these memories, there is one that remains with me vividly, and that is the feeling I had when I went out late on Sunday afternoon and took a walk up Tudor Mountain Road. There was absolutely no sound – total stillness, total quiet. The awesome power of nature had brought our busy human activity and our all-important control, to a halt. In that moment it was very clear that something bigger than us was in charge. I’m not sure if that is how you know you’ve been through a natural disaster, but at that time it sure seemed that way to me. 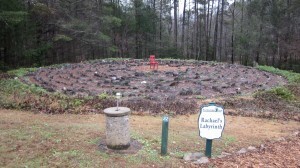 My first memory of Buckhorn is from 1952 when I was six years old–61 years ago. We were staying on the second floor in rooms looking over my beloved Mt Le Conte–my parents, a mother’s helper and me. There were many trips after that, originally with then innkeeper Doub Bebb fixing a fine breakfast, a tradition I am grateful has continued and expanded under Lee and John’s gracious stewardship. I came to the Inn over the years with my parents, my great friends Judge Macauley Smith and his wife Emmy, with other friends and hikers and for the past 15 years with my husband Boyce Martin. This Thanksgiving (2013) is our fifth with Lee and John and what a feast it has been. It wasn’t always this way. One memorable Thanksgiving in the mid-1970s I was with the Smiths in the only heated building at the time–either Cottage 3 or 4. The Inn itself was closed for the winter, but Doug agreed to let us stay in the cabin. I slept on the living room couch. Judge Smith and I wore matching fire engine red pajamas from LLBean. Most memorable was our Thanksgiving dinner, cooked in the cabin in a cast iron skillet supplied by Emmy. 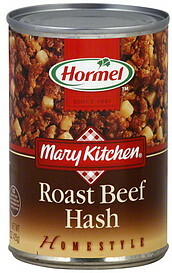 It was canned roast beef hash to which she added onions and green peppers–and lots of sour cream. It was delicious, enhanced no doubt by the invigorating mountain air and a generous amount of cheering libations. The Judge was a bourbon man and supplied me with Boisiere dry vermouth. 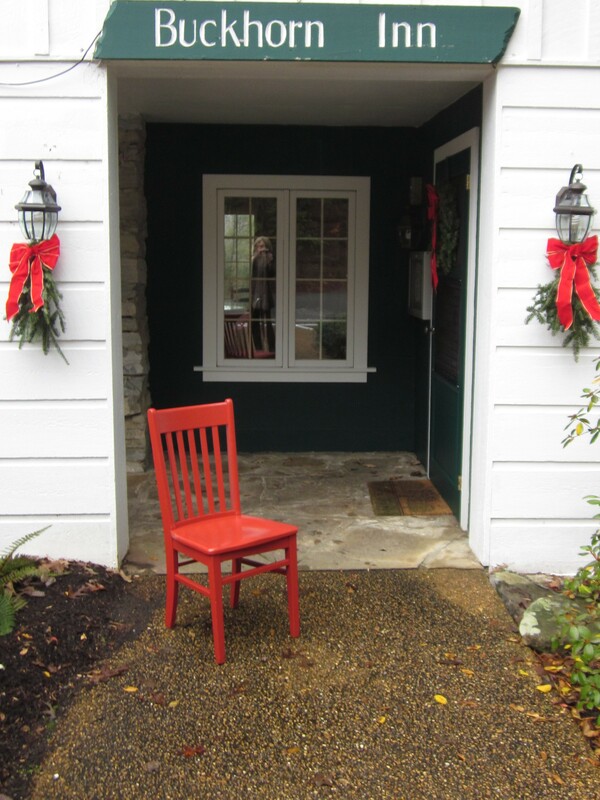 These last few days It has been our pleasure to host a visit from the official symbol of the Professional Association of International Innkeepers–The Red Chair. 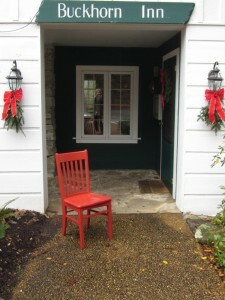 The Red Chair is on a nine-month journey that started in Maine and will finish in California in 2014. Red, as we familiarly refer to him, confided confidentially to me that the Smokies has been his favorite destination so far. We have a story for you about his visit to Buckhorn. The Red Chair Gets a Paint Job The Red Chair arrived tired at Buckhorn Inn after his weeks of traveling and longing for the Orange Chair that had kept him company at his previous stop at Creekwalk Inn. 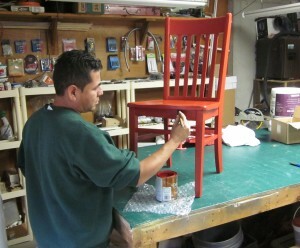 We offered him a Blue Chair who was visiting but he said “My heart belongs to Orange.” He was slightly unkempt and grouchy, so we decided a day in our workshop would do him good. (I know I always feel better after a day getting “fixed-up” at the beauty salon.) Hugo tightened up his loose bits and gave him a coat of matching red paint and he professed himself ready to face the world again after a quick look in the mirror. The Red Chair Officially Arrives Red had been admitted to the Inn via the back entrance when he arrived because he said “I don’t want anyone looking at me until I get a paint job.” So, we asked him nicely to make his entrance official by coming in the front door, which is the most popular place among our guests for picture taking because of the sign that says “Buckhorn Inn.” A bit vain, Red preened for the photo and we had to show him several versions before he was satisfied with this photo shown here. Doesn’t he look great? Well, at least that was Red’s opinion. 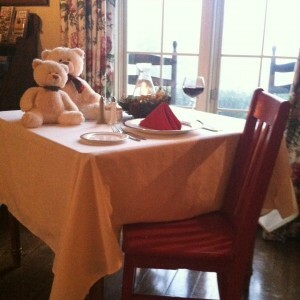 The Red Chair Dines with Friends “What I want is a good dinner with great service and ambience. An excellent wine list would also be welcome,” Red demanded (or asked politely depending on who is telling the story.) Innkeeper John Mellor told Red he had come to the right place as Buckhorn is the only inn in the area that serves dinner nightly. He gave Red the best seat in the house and comped him for this fine dinner, Red having pointed out that he is, after all, the Official Ambassador of our national Bed and Breakfast association. As all of us who have been lucky enough to know, Red makes friends wherever he goes and here at Buckhorn he soon became the center of attention. Crowds got a little too friendly at times with some of our guests actually wanting to sit on him! Red did invite the Buckhorn Bears One and Two to have dinner with him because they just adored him. Buckhorn Bear One said of him “Red is so tall and handsome—I just can’t take my eyes off him.” Buckhorn Bear Two had tears in her eyes when Red had to leave the next morning. 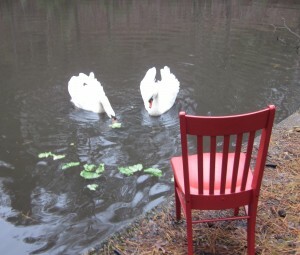 Red Feeds the Swans Red’s favorite stop on his walk (I use this term “walk” figuratively as he was actually transported about on one of our golf carts) was Buckhorn Pond. Why? “Well,” he said, this is a beautiful, peaceful pond where I could spend several hours just sitting on the bench but the sight of two beautiful swans swanning about came as a big surprise. Fortunately, my driver had brought a good supply of lettuce for Swans Pentu and Teller (get the joke?—they are mute swans). “ As pointed out previously, Red makes friends wherever he goes and he and Pentu and Teller were soon trading stories and cracking jokes. Red Says Goodbye It was hard to say “tata” to Red, but we understood he had his work to think of, pleasurable as it is, and we couldn’t be selfish with his company. 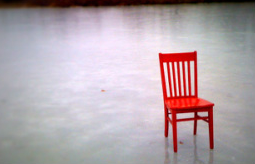 After all, he had given up his love for The Orange Chair because of his responsibilities. Like Buckhorn Bear 2, we had a tear or two our eyes as Red made his departure but we comforted ourselves with the knowledge that he was being delivered into the warmth, comfort and charm of our neighbors at Foxtrot Bed and Breakfast. We recently had the pleasure of hosting Bill and Gwen Baddley from Baton Rouge–after an absence of five long years. It was great to renew our relationship and to see them so healthy and happy. They have been traveling the world these last few years and we have missed them. They did a first for Buckhorn–producing a three minute video which shows them during a visit that had snow, Christmas decorations, and sunshine. If you have the three minutes, click here to see the video.